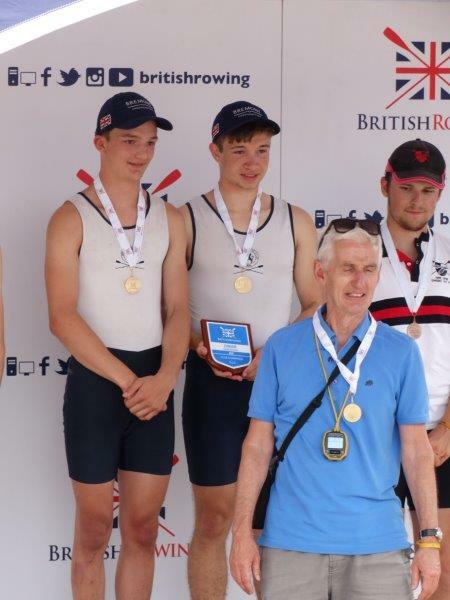 The British Rowing Junior Championships with over 1300 athletes in 884 crews took place at the National water Sports Centre in Nottingham 20th -22nd July 2018 . For Henley Rowing Club Juniors this is the final regatta of the season which ended on a high when for the third year in succession they won the Victor Ludorum for most successful club at the event. The racing on Saturday comprises time trials from which the top twelve crews progress to Sundays semi finals. Twelve of Henley’s fifteen crews progressed to Sundays semis and from the semis eleven crews progressed to A finals. Producing a final medal tally of four Golds and three silvers. 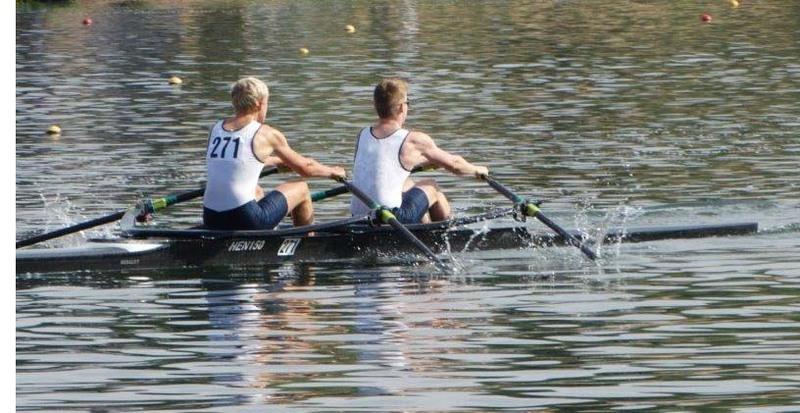 The first gold came from the boys of John Yolland and Ollie Taylor who only J17’s rowed up in the J18 pairs event and had an exciting dual with Queen Elizabeth High School over the whole course neck and neck all the way with the Henley boys just taking the Gold on the line. The first gold for girls came in the coxless fours, Emeline Warner, Pheobe Snowden, Caoimhe O’Donhue, Carla Russell. A slow start saw the girls have to race through the field, at half way the girls where in third place with clear water between them and the crews in front of Notts County and Glasgow, with 500 to go overlap existed with all three crews but Henley still in third, in the last few hundred metres Glasgow and Notts faltered whilst Henley moved on to take an almost comfortable victory of 2.5 secs. 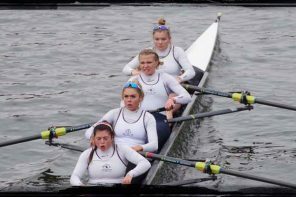 Immediately following on from the coxless fours race was the Under 16 girls quad of Hannah Hills, Charlotte Rowley, Amber Weller and Georgia Brown. 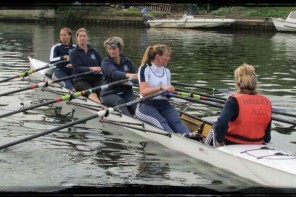 This quad has been successful all year and the only disappointment was not qualifying for GB France match where they lost out to Marlow by 0.6 sec. This wasn’t going to be repeated and they took an early lead with the closest competition being Marlow but even they ended 8sec behind at the finish. 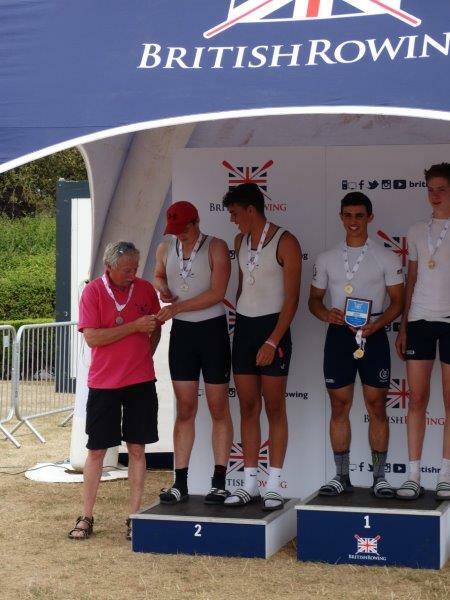 The boys coxed J16 four of James Wallace, Soran O.Connor, Charlie Garnham, Alex Carr with David Wallace knew from the time trial that a medal would be difficult but came a very acceptable fourth in the A final. Like wise the girls J16 4+ comprising the J15 crew of Gina Segrt, Darcey Smith, Holly Thompson with Amy Howard sitting in on the Sunday for ill Emila Fulford Dobson new they had to put in a special performance to medal and whilst they raced well could not quite hold onto third place and finished in fourth behind Great Marlow school. The boys J16 doubles event followed with Seth O’Connor and Ed Roy taking silver just missing out on gold by 0,19sec. The three medal contenders battle all the way up the course with Globe beating the Henley boys by about half a metre in the last few metres of the race. In Women J18 eight final Henley had two crews none of whom were J18, the A crew was the J16 8o of Charlotte Rowley, Hannah Hills, Amy Howard, Milly Guida, Amber Weller, Pheobe Snowden, Carla Russell, Georgia Brown and cox Ella Nolson, and the C crew the J15 8o of Holly Nave, Annabelle Hoogenberg , Riley Butcher, Caiomhe O’Donohue (last minute sub for Emilia Fulford Dodson who was taken ill after the time trial) Issy Cotton, Georgie Pollard, Holly Thompson, Ava Reineke cox Chloe Beeton. The A crew had a good tussle with Lea RC up the course to 1500 but in the last 500 the Henley crew established a commanding lead to take Gold. The C crew could not quite hold a composite crew from Kings Canterbury, Durham Sch, Maidstone Invicta and had to settle for a respectable fourth well ahead of Great Marlow school fifth and another composite in sixth. In one of the toughest races of the day Holly Cookson led the field in WJ15 single sculls all the way to the line, executing her race plan perfectly but was caught literally on the line by A Patton of St Andrews BC with the result having to go to a photo to decide that Patton had just beaten Holly. Holly then had to immediately get into the WJ15 quad for the last Henley race of the day, where she joined Georgie Pollard, Izzy Cotton, Della Luke and cox Ava Reineke. This final was always going to be a race between Henley, Marlow and Trentham and so it was, with the three boats overlapping all the way up the course the lead changing between them but Henley just leading in the last few hundred but then pipped by Marlow who took gold and Henley the silver. 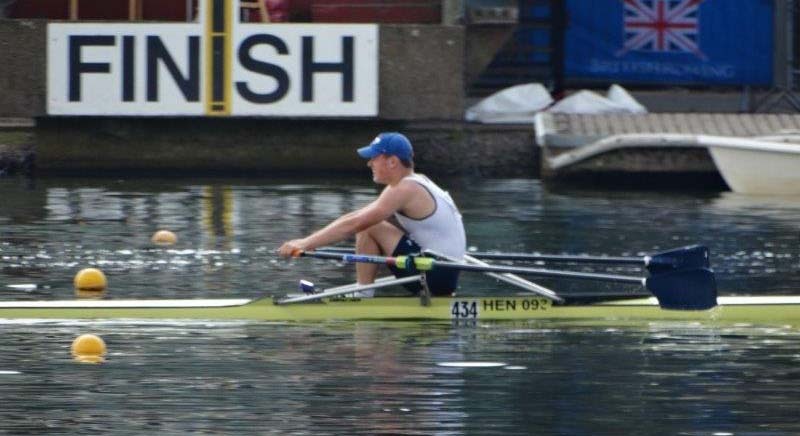 In the minor finals Cameron Seager won the J15 C final in his single, Ethan Chatfield came second in his J16 D Final and Holly Nave and Gina Segrt fourth in the WJ15 2x C final. Following success at selection trials two weeks ago Phobe Fletcher, Alice Jones, Maddy Pollard, and Grace Johnson travelled to Cork, Ireland to represent England in the annual Home Countries International Match against, Scotland, Ireland and Wales. Whilst the Henley girls held off challenges from the Irish and closed the Scottish lead down in the last few hundred metres they couldn’t quite get past the Scots who hung on to take the Gold medal. The second place points though contributed to the England Team winning the Junior girls match. 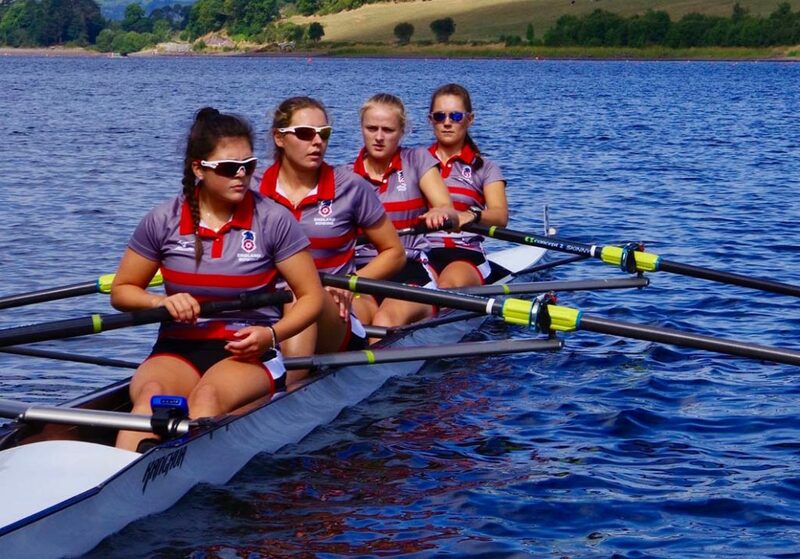 Following a process that started last October and concluded with trials two weeks ago five Henley girls have been selected to represent Great Britain at the World Rowing Junior Championships in Racice in August. Georgina Robinson Ranger and Lottie Orr will compete in the quad, Mary wright and Daisy Butterworth the coxless four and Issy Jonsson the pair. 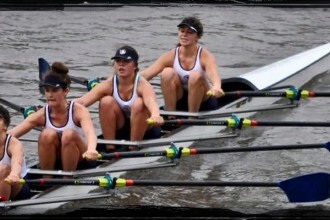 A sixth member of the Henley squad ,Sophia Hahn, will also be at the Worlds but as part of the USA team. This ends the season for the juniors but for anybody interested in joining the season starts with meetings at the club on the 6th Sept 6:30 for those born on or after 1st Sept 2003 and on the 8th Sept 10:00 for those born between 1st Sept 2000 and 31 Aug 2003.